I more or less followed the ingredient list on Eating Bird Food to make this pizza crust. I adjusted according to my taste and you may need to do the same thing for you. It is delicious crust. However, it is not as crispy as I would like, but still delicious! I’m so excited to be able to add pizza back into my menu plans. I do think I’ll need to buy a food processor though. I used a cheese grater and it took quite a while to grate enough cauliflower for 2 cups. 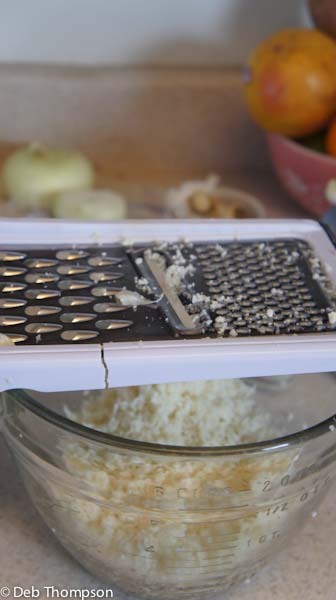 Yes, I need a new grater, or better yet a food processor, it takes forever to shred the cauliflower this way. 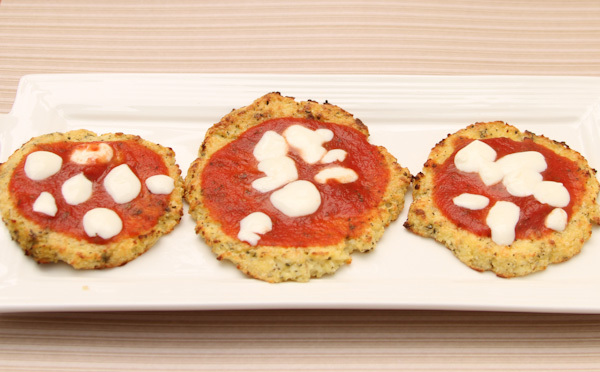 After you have the cauliflower grated this recipe is quick and easy to put together. This is a great recipe for those that are trying to eat gluten free or carb free (not sure if it qualifies as a paleo recipe or not). Cook cauliflower in microwave for 6-8 minutes until cauliflower is cooked and almost translucent in color. Add garlic, ricotta cheese, egg, Italian seasoning & salt. Mix completely. Line a cookie sheet with parchment paper and place a heaping spoon full of crust mix on the tray. Press into a 1/4″ to 1/2″ circle. Bake mini pizza crust at 400 degrees for 15-20 minutes or until crispy on edges. Remove from oven and top with sauce, cheese or toppings of choice. Be careful not to put too many toppings on your pizza crust because it might fall apart. Place mini pizzas back in the oven and broil for 5 minutes. These are the perfect paleo treat!